A pet owner in Happy Valley-Goose Bay said she and her dog have been left traumatized after the Lab-Husky cross was caught in a trap within town limits last week. 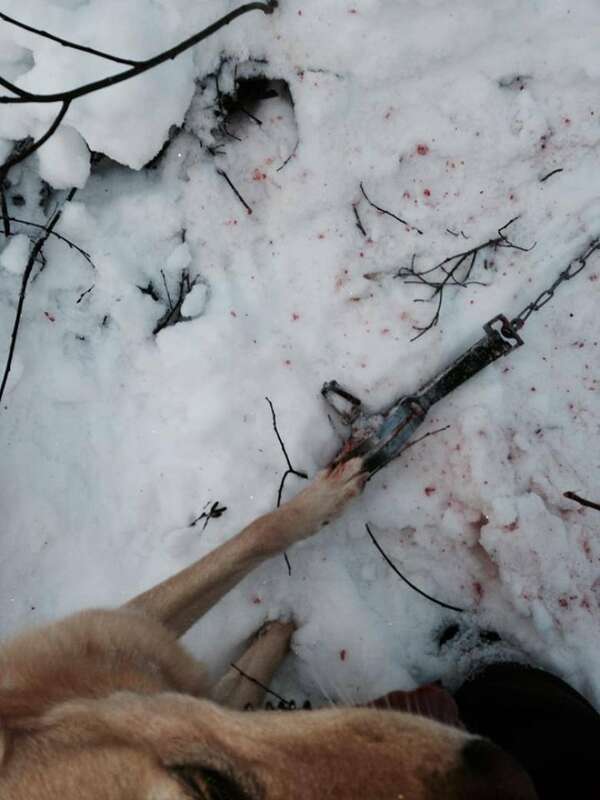 Wildlife enforcement officials are investigating the case, and are appealing for the public's help in finding the person who left a live trap in the area. 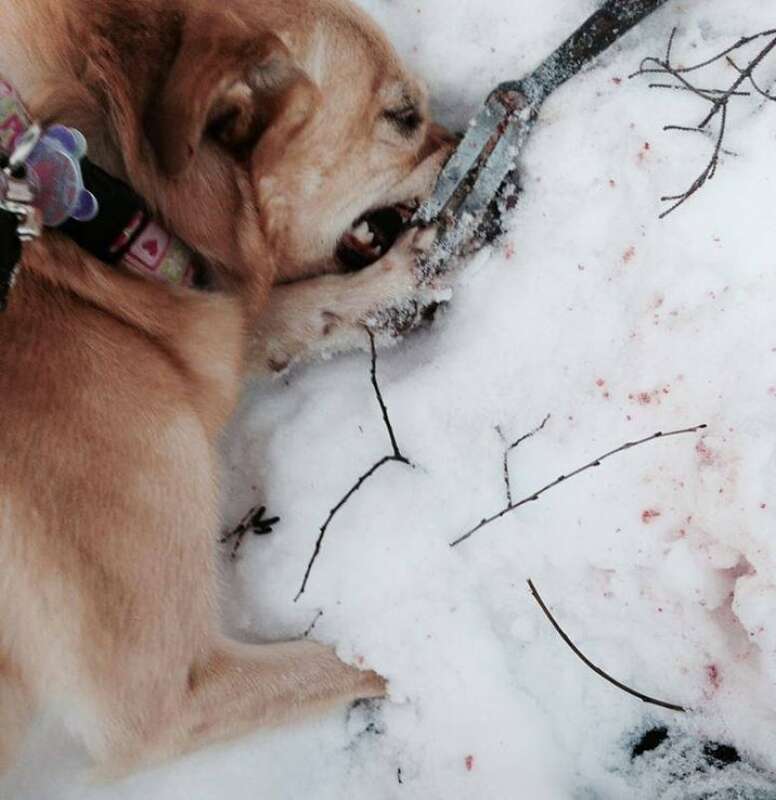 Peg Pelley's dog, Bella, got her leg caught in the device while out for a run in a quiet area of town. "If somebody hurts somebody that I love or something that I love, you know, I mean I still got knots in my heart and this was Friday but I'm still knotted up about it," Pelley said. Pelley had her two dogs out on Friday, but when she called to them to leave — only one came back. "So I listened and I could hear Bella crying and screeching out," Pelley said. But she couldn't see the dog, so Pelley flagged down a snowmobile. The driver, John Hudson, took a look and found Bella down in a hole with her leg caught in a trap. Pelley said her dog was totally frantic. 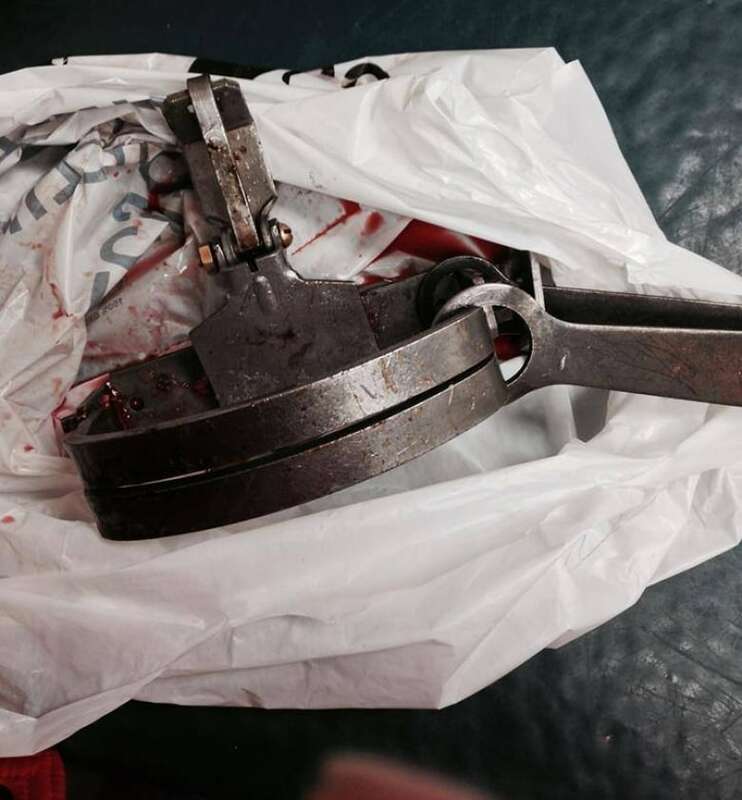 "She was chewing on the trap trying to get out of it. So I got down there and I held her head away from the trap and John did everything in the world to try to get the trap open and of course we were both very upset and she was crying and he couldn't get it open. There's no way he could get it open,"
Hudson went to get tools while Pelley stayed with Bella. While she waited for him to return, she took photographs to document what her dog was enduring. Even with the tools, Hudson had a difficult time getting the trap off Bella, but he eventually managed to free the dog. Pelley said she took Bella to the vet right away. "She got into her mouth and her mouth was just a total mess. Her gums were all tore up and her teeth, there was 17 teeth cracked …10 gotta come out and they're going to try to do some work on the other ones so that she can keep them. But we have to take her to Montreal," Pelley said. "The vet said if it was a smaller dog it probably would have cracked her leg right off." Pelley said the trap was off the trail, down a hole and attached to a tree but she said it was too close to the road and the trail. She said traps should not be allowed within town limits where children and pets could get caught in them. "Did you ever look at a map of Labrador and see all the land and the wild country that's here? Seriously. They don't need to trap right there where people are with their kids and pets and everything," Pelley said. Pelley admits Bella was off-leash, but says dogs — especially big ones — need to run, and there's no dog park in Happy Valley-Goose Bay. Pelley took the trap and turned it over the RCMP. She would like the person responsible for the trap to come forward and apologize. Pelley said she's now worried about Bella travelling to Montreal to get her teeth fixed. "It's going to be hard for her to go on a plane because she's nervous anyway … and then she had to have a tooth removed last year and she was in a mess. But this time she has to have 10 removed. So I don't know what kind of stress she's going to go through," Pelley said. "She was rescued. She was rescue dog. And I sort of promised her that nothing would ever hurt her again. But I really feel responsible...It's hard to see her suffer like that. I have a lot of health issues and they're the ones that kept me going when I wanted to give up."